On 27 November were buried the four members of the justice house La Patria es Primero (“The Nation First”), affiliated with the Regional Coordination of Communal Authorities-Communal Police (CRAC-PC), who were killed the previous Thursday in Tixtla by presumed members of organized-crime groups. The prosecutorial office of Guerrero state released a communique reporting that it will “investigate the aggression perpetrated against seven members of the CRAC-PC’s justice house […] in which four of these agents lost their lives in the Tixtla municipality.” According to the representatives of the justice house in question, behind the execution of their comrades the responsibility likely belongs to the organized-crime groups Los ardillos and Los rojos that are battling over control of the Tixtla plaza. On 7 December, four years passed since the forcible disappearance of the leaders of the Organization of Ecologist Peasants from Sierra of Petatlán and Coyuca de Catalán, Eva Alarcón Ortiz and Marcial Bautista Valle. The daughter of Eva, Coral Rojas Alarcón, said, “I am convinced that they have been killed, but they deserve a burial. I want to find my mother and Marcial.” Marcial Bautista and Eva Alarcón were forcibly disappeared on 7 December 2011 in the Grand Coast of Guerrero by a group of armed men that according to eyewitnesses were being protected by the Army and agents from the ministerial police. The activists had dedicated themselves to the management, conservation, and sustainable use of the forests. The defense of the forests led them to denounce abuses committed by the Army and the illegal work in which police had been involved. Nine municipalities of the Sierra Madre and the Soconusco in Chiapas state have ratified the declaration that their lands have been freed of mining operations and dams. Using the III Declaration of Tapachula for Lands Freed of Dams and Mining in the Sierra Madre and Llanura Costera of Chiapas, some 40 indigenous and campesino ejidos, communities, and social organizations reaffirmed their commitment (adopted in 2013) to the defense of their territories against plundering as carried out by transnational corporations. 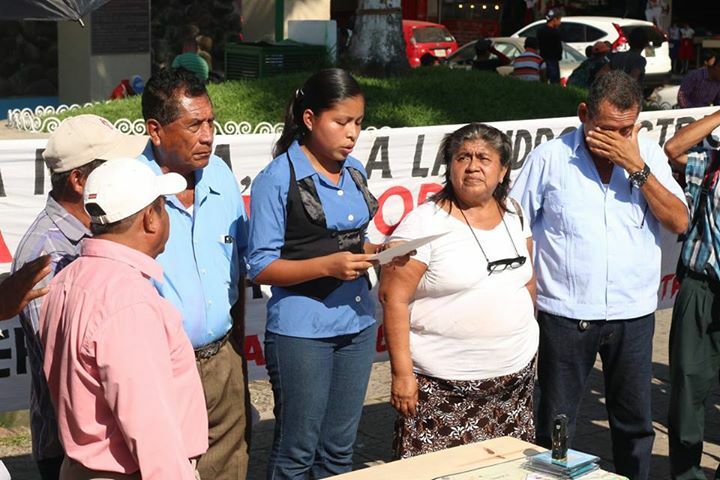 The municipalities of Tuzantan, Huehuetan, Motozintla, Tapachula, Escuintla, Acacoyagua, Chicomuselo, and Comalapa denounced the collusion of municipal and state governments with the firms to obtain permits for the exploitation of lands and rivers. They also rejected the models of development, water management, and energy policy that have been imposed in Mexico by structural reforms, particularly the energy reform. “In light of the opposition against extractive projects on our lands, we propose to organize and link ourselves with other struggles that seek to defend their rights and the natural resources of water and land.” In this way, the representatives of the municipalities affirmed that they have ties with other movements, especially in Jalisco, Nayarit, Puebla, Oaxaca, Guerrero, and Veracruz. These are alliances with other struggles over the right to decide what happens on their lands, in favor of living well and strengthening oneself amidst the repression meted out toward defenders of the Earth. It bears recalling that on 30 November the Union of Campesinos and Fisherfolk of the Sierra and Coast of Chiapas also declared their municipalities free of dams and mining operations. At a press conference on 3 December, the subsecretary for Planning and Evaluation of the Ministry of Public Education (SEP), Otto Granados Roldán, said that a group of teachers had registered for the performance evaluation toward the end of disrupting it. Some 70 teachers who registered sabotaged the network of 2,800 computers contained in the Imperial World of Acapulco. Nonetheless, 500 teachers continued completing their exam. 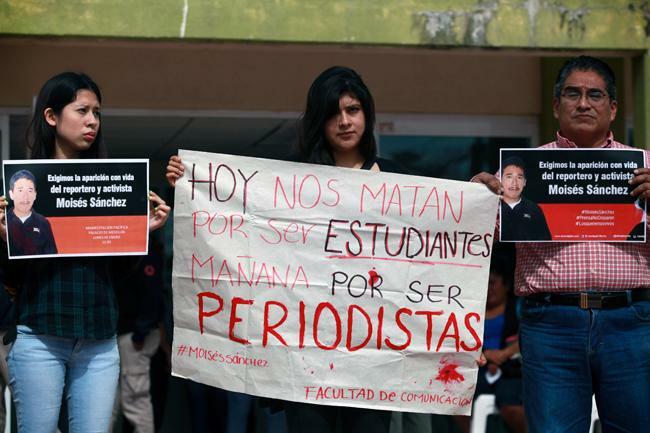 The SEP in Guerrero indicated that it would prosecute the teachers who disabled the network, and that they would be sanctioned. The day before the evaluation, some 3,000 teachers from different institutions and educational levels were transferred to the Acapulco port and put up in luxury hotels, such as the Princess, Pierre Marqués, and the Imperial World Resort, property of the Autofin group, which is owned by the capitalist Juan Antonio Hernández. The next day, to enter the World Imperial Forum, teachers passed through police checkpoints featuring anti-riot equipment and high metal bars. Some 6,000 federal police were sent to Acapulco to protect the World Imperial Forum, where the evaluation was held. During the test, many were bothered by the lack of computers and the behavior and presence of the police. Many teachers attempted to leave, but the police forced them to say. When the governor Héctor Astudillo arrived later to the Imperial World Forum, personnel from the SEP offered money to teachers so that they would continue taking the exam. The action served to commemorate the men and women who have been politically imprisoned in Chiapas, Mexico City, Tlanixco (Mexico State), Guerrero, Michoacán, Oaxaca, and the U.S. whom the “capitalist system seeks to eliminate, using tools of isolation and forgetting.” This was accomplished through different events, meetings, expositions, murals, chats, flyers, performances, and conferences throughout Mexico and the world.